What’s new in the world of tiling? It may be something that’s as old as time itself. For centuries, natural stone tile has been used to embellish the homes of people everywhere. And with good reason. It’s one of the most durable products in nature. And you won’t find anything as beautiful as natural stone laid throughout your home. But natural stone tile isn’t without its problems. 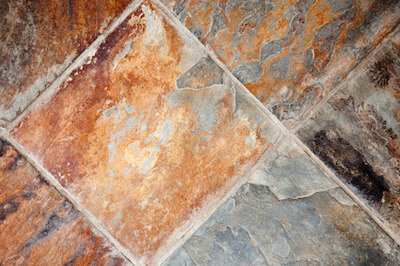 Because natural stone tile has natural traits; they exhibit variations in color and thickness. Every stone is unique, and therefore every floor will take on individual characteristics. For flooring in residential use, you’ll typically find one of five natural stones in use: marble, granite, slate, limestone and basalt. Marble is a metamorphic rock that is created through intense pressure. Although marble may appear pure white in hue, it often is veined with a variety of earthy colors, depending on the minerals present during the time it was formed. Marble is relatively compact, making it easy to cut and work with. It is an excellent product to work with in all kinds of manners throughout your home, from floors to walls and fireplaces, as well as countertops and backsplashes. It must be honed and sealed to reduce its porosity. Granite is an igneous rock, meaning it is volcanic lava or magma that has cooled and hardened. You’ll find it in white, gray or pink in color, with characteristic dark speckles throughout. It’s attractive appearance combined with its incredible toughness makes it an excellent choice for flooring. It holds up extremely well in high traffic areas, and is often the perfect choice for kitchens and bathrooms. Slate is also metamorphic rock. Most often you’ll find it in shades of gray, sometimes with purple, green or blue undertones. Slate is long lasting and easy to care for, making it the perfect choice for all kinds of uses throughout your home. Limestone is a sedimentary rock, formed from tiny mineral deposits along bodies of water. It’s usually white, off white, beige or gray in hue. It is readily available and one of the most affordable stones on the market. It cannot be polished and is generally a softer stone, making it easier to scratch or stain. You will find travertine tiles, another form of limestone, that is capable of taking polish. Both forms are used widely in all kinds of residential and commercial uses. Basalt is an igneous rock, with coloring from a light to deep gray, brown or black. It’s a durable, fine grained, nonporous natural stone that makes it an excellent choice for both floors and walls. You’ll often find basalt used outside as well, such as in swimming pools, garden paths and other water and garden features. What’s the perfect natural stone tile for your next project?